MEXICO CITY (CNS) — A Nicaraguan bishop urged the country’s embattled president to “reconsider” his repression tactics as the country convulses with protests against corruption and authoritarian rule and the Catholic Church tries to play the role of mediator. “I ask you, Mr. President, that you rethink with your Cabinet the path you have taken. 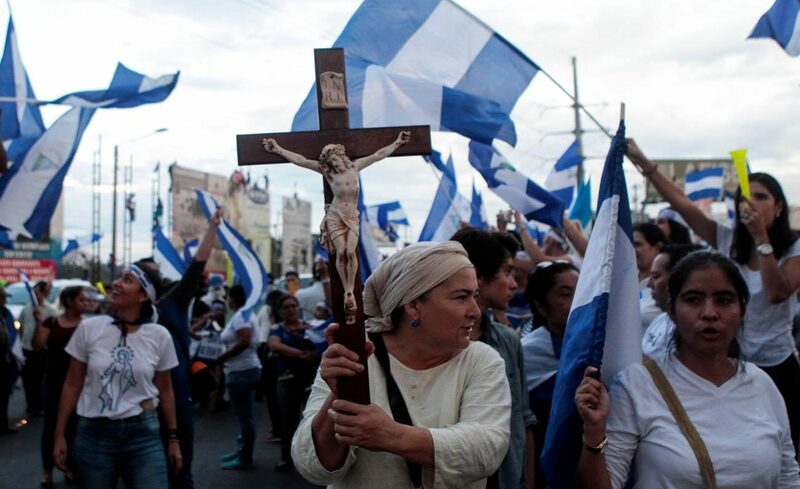 It has started — I say this with pain — a non-armed revolution,” Bishop Juan Mata Guevara of Esteli told Nicaraguan President Daniel Ortega May 16 in the opening session of a national dialogue organized by the nation’s bishops. “If you want to dismantle the revolution, it is not a matter of pressure, of rubber bullets or lead bullets,” he added. Nicaraguans have taken to the streets for weeks, first, to protest a reform to the country’s social security system, but also what they consider mismanagement and corruption by the president and his family and a heavy-handed crackdown on students and the media. At least 49 people have died amid the unrest, according to Reuters, and protesters allege excesses have been committed by paramilitaries known as the Sandinista Youth. Bishop Mata told Ortega — who fought in the Sandinista struggle three decades — to return police to their barracks. The Nicaraguan bishops’ conference convened the dialogue to resolve the conflict in Nicaragua. The opening session allowed Ortega’s opponents to unleash criticism. Shouts of “killer” could be heard; the names of the dead were read. Students took the president and his wife, Vice President Rosario Murillo, to task for the crackdown on young people in the streets during a roundtable at Our Lady of Fatima Seminary in Managua. Commentators called the criticism unprecedented. A poll published May 16 by CID Gallup showed 69 percent of Nicaraguans want Ortega and Murillo to resign. Nicaragua’s bishops have tried to play a peacemaking role; some in the church have acted on the local level. Videos on social media showed Franciscan friars in Juigalpa acting as human shields amid the protests. Some dioceses urged prayer and fasting. The Diocese of Jinotega published a video on social media of a May 16 attack on the cathedral, where it said physicians and medical students were inside offering humanitarian assistance. Analysts say the Catholic Church is positioned to play the role of mediator, given its standing with both sides. “The Catholic Church took a lot of risks in making today’s dialogue happen,” said James Bosworth, a former Nicaragua resident and founder of Hxagon, a political risk analysis firm. “A negotiated exit for Ortega and his family is far better for Nicaragua than a violent protest to oust him or a violent repression of the civilian population that maintains Ortega in power. For that reason, as uncomfortable as it is for both sides and as much as they dislike and disrespect each other, the Catholic Church should work to keep the two sides talking,” he said.